Warmer weather is ideal for most animals. This is no different for pests, most of which easily find food and reproduce during the spring and summer and on into the warmer early months of fall. Most homeowners that have been fighting back pests throughout the year hope that they’ll get some relief in the winter. But while it does slow most pests down, winter’s cold weather doesn’t put an end to them entirely. Instead, it often makes them less visible. Many insects do die in the harsher weather. But others can go into a state of hibernation or retreat to warmer, protective homes like logs, tree trunks, or the attic in your home. Mammals like rats and mice are also experts at seeking out warm, food rich hideaways like your home. Bed bugs are also common during winter, because bed bugs spread when people travel, and winter is a prime travel month. If your home already had pests, winter is less likely to slow them down at all, and may provide them with a fertile breeding ground to grow and spread. Seal Outdoor Access Points – All manner of pests can squeeze in through a crack between the wall and door at the front entrance or at the point where utility pipes enter the house. Even a hole the size of a dime is too large, as mice can fit through. Properly Store Food – Food that isn’t properly sealed in the pantry are irresistible to pantry pests like beetles and moths as well as rodents and other pests seeking food in the leaner winter months. Make sure all containers with food in them are tightly closed when not being used and quickly clean up any spills. Control Moisture – Pests need a water source as well as food, and leaky pipes, clogged drains, and other moist areas are perfect for them. It’s especially crucial to keep an eye on bathrooms and kitchens as they typically have more moisture than other areas of the home, making them attractive to cockroaches. Eliminate Clutter – Clutter makes it easier for pests to hide and stay warm, so even though holiday decorating may make this more difficult, keep storage areas organized and clean. It’s also a good idea to store things off the floor on a shelf or rack whenever possible. Watch Out During Travel – Some pests have no problems in winter. That is especially true of bed bugs, that can withstand cold temperatures. Since winter is often a vacation month, it is important to pay attention for signs of bed bugs when traveling to avoid bringing them back to your property. Pest infestations overall are less likely during the winter, but they still happen often. 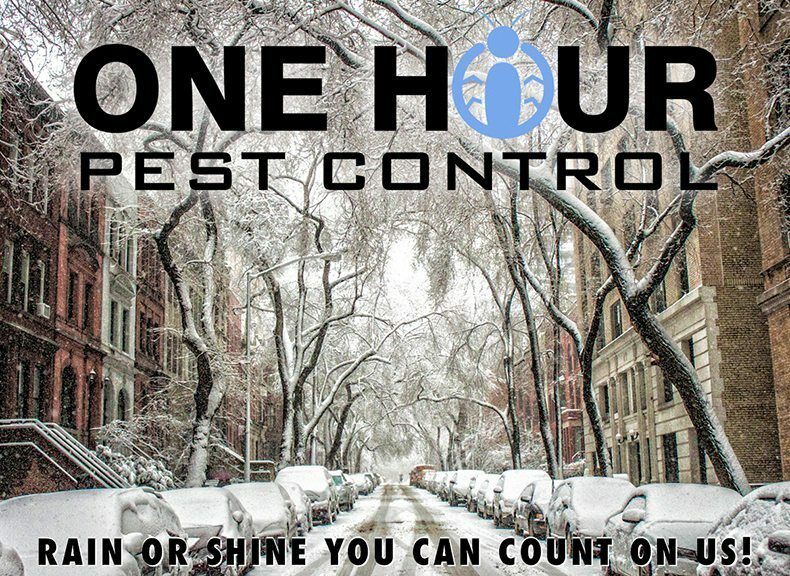 If you think you have a pest problem this winter or any other time of the year, contact our pest control professionals at One Hour Pest Control. We can also offer help with any pest preventive steps you’re taking in preparation for the seasons.